MCLOUD, Okla. (February 11, 2019) — Today, The Last Mile (TLM), an organization that prepares incarcerated individuals for successful reentry through business and technology training, launched the first computer coding course to be offered inside Mabel Bassett Correctional Center. 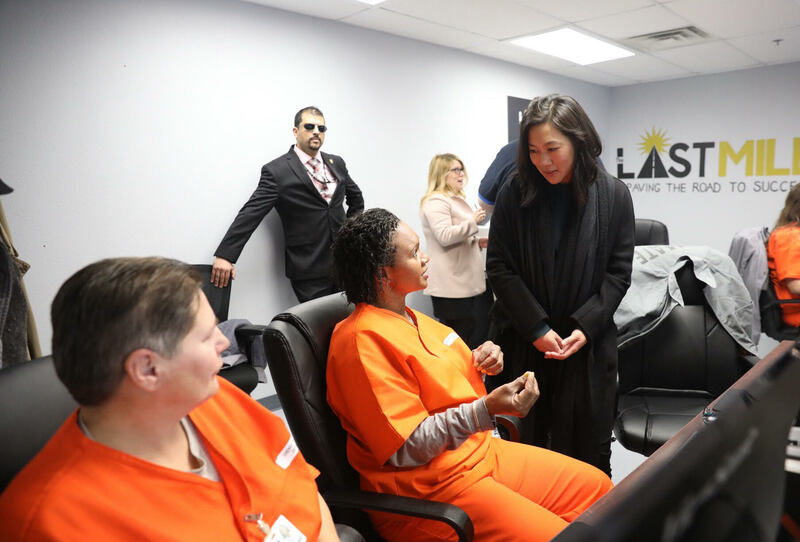 This expansion into Oklahoma was made possible by the Chan Zuckerberg Initiative, George Kaiser Family Foundation, and the Lobeck Taylor Family Foundation, in partnership with the Oklahoma Department of Corrections and other local actors. According to a recent report by FWD.us, one in two Americans have an immediate family member currently or previously incarcerated. Oklahoma has the highest incarceration rate in the country, with a female incarceration rate that is more than twice the national average. These troubling statistics have held back Oklahoma’s families, communities, and economy. In response, a bipartisan coalition is working to safely reduce incarceration in the state and expand opportunities for people with felony convictions. In 2016, Oklahoma voters passed sentencing reforms at the ballot and, since then, the State Legislature passed additional reforms to build on the voter-backed improvements. Just last week, Oklahoma Governor Kevin Stitt called for further legislative action during the 2019 session to keep families together and reduce unnecessarily long prison terms, and begin moving Oklahoma out of its spot as the nation’s top incarcerator. 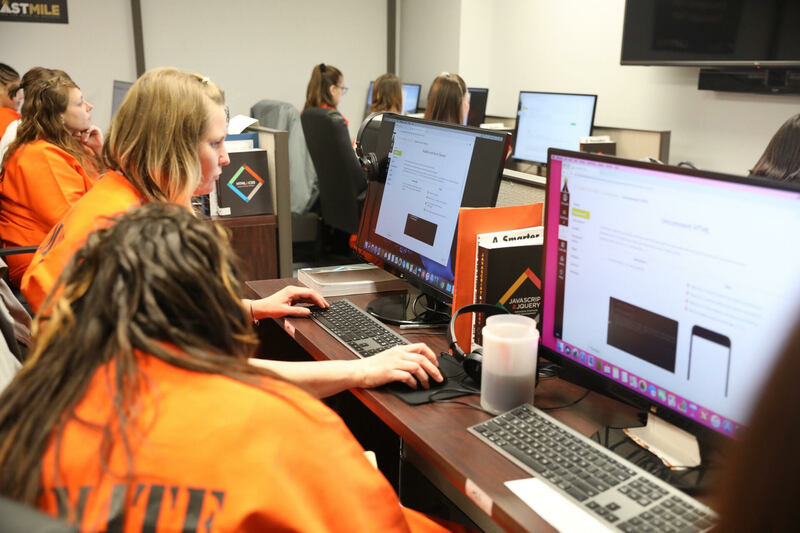 Women at Mabel Bassett Correctional Center in McLoud, Oklahoma, can now enroll in the year-long training program, where they will build software engineering skills and gain exposure to real-world projects. They will do this without access to the internet, given restrictions within the prison. Students use a special software programming platform that mimics the internet while also giving participants a live coding experience. Seventy-five percent of the program’s eighteen students are mothers with less than three years remaining on their sentences. They will join nearly 500 men and women across twelve prisons in four states that have moved through the program. Graduates currently work for a variety of employers, including the Chan Zuckerberg Initiative, Fandom, software startups, and others. “The mission of LTFF is to decrease barriers associated with dreaming big. We are passionate about utilizing innovative solutions to systemic problems, so we were instantly attracted to The Last Mile’s approach that not only builds the Oklahoma workforce from within, but builds community while also giving a second chance to justice system-involved women. The Last Mile uses an innovative framework that encourages entrepreneurship and skill-building with a group of women that would typically face great barriers to pursuing those dreams. I’ve had the opportunity to meet graduates of this program from San Quentin State Prison who have rebuilt their lives and left prison with a quality job, benefits and a purpose. We’re pleased at the opportunity to collaborate with such a status-quo changing organization, as well as our partners at CZI, GKFF and the DOC,” said LTFF CEO and President Elizabeth Frame Ellison. The Last Mile will officially launch today with an event and ribbon-cutting ceremony at Mabel Bassett. Speakers to include: Beverly Parenti, Co-founder of The Last Mile; MC Hammer, The Last Mile Board Member; Aly Tamboura, The Last Mile Graduate and CZI employee; and representatives from the Oklahoma Department of Corrections and the new student cohort.